This week’s Cyclist of the Week is, Bill Anderson with 360 Cycling Team! Bill is a huge supporter of the cycling community donating funds, port-a-potties and he also supports cycling teams and juniors. Thank you Bill Anderson for all you do! You are amazing! Myself and several other youth were invited by members of the Mt. Oread Bicycle Club to ride the Octoginta in the early seventies. The ride was two days with an overnight campout. I can remember just riding my bicycle and ending up at Douglas County fishing lake. There was a campsite set up with tents, sleeping bags, and food! Hooked for life. I began riding daily in 1973. There was an outdoor store in my hometown of Lawrence, Kansas by the name of Gran Sport. They stocked high quality camping, climbing and cycling equipment. Many of the staff were racing cyclists and were very inclusive to several youth who frequented the shop. Several times a week after work and school we would ride for several hours around Lawrence and rural Douglas County. The more we rode the more excited we became about all things “bicycle”. We also gained fitness and learned to ride in a group. We joined Mt. Oread Bicycle Club. Group rides became fast group rides and by 1977 I was a racing cyclist. 3. What was the biggest challenge you faced as a new rider? Quality equipment was both hard to find and hard to afford. This was when I first learned about the rare metal, “unobtanium”. There was not a lot of “sanctioned” racing in Kansas in the 1970’s. Being less fat and to beat Shad Smith (like everyone else). 6. Who has helped train and encouraged you along the way? Jim May, Mike & Judy Hudson, Mickey Imber, Phil Heying, Leroy Chaney, Dennis Scott, Jim Whittaker, Dean Parker, Adam Mills, and my many teammates during the past few decades. 7. 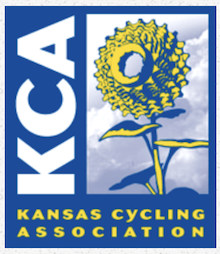 Where is your favorite place to ride in the KC Metro? Cliff Drive. 10. Where do your work? I work with my family at Anderson Rentals in Lawrence, Ks, an equipment rental business. I live in Kanwaka Township with my wife, our two dogs and two cats. 11. What was your most epic cycling adventure? In 2010 I went on a fully-loaded cycling tour on the Katy Trail across the state of Missouri. On the surface this seemed like a very quiet, almost boring ride. However, it began to rain in Clinton, MO as soon as we began and continued to pour down for 3 days. The trail eroded, trees fell, power lines were down. The river rose 16ft in three days. We watched debris floating by us. Bridges would move under us while the water and parts of houses would crash into them. We were always on the edge of hypothermia. Best ride ever!